A few weeks ago, my friend Laura mentioned a cookie that she ate while on vacation. It sounded so good, that I knew we had to find a recipe & have a baking date! 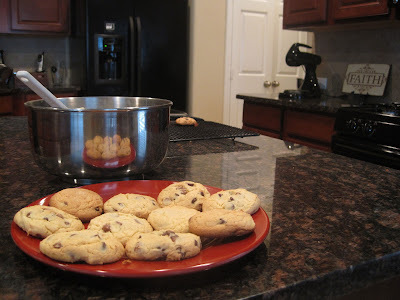 Yesterday, we finally got our chance to make chocolate chip cookies + sea salt!! I'm sure you could use any ol' chocolate chip cookie recipe & add sea salt on the top, but ours was super yummy & super easy! I had heard of making cookies out of cake mix, so I decided to look on my trusty recipe site: allrecipes. I love that site because of the many different ways you can search (by looking through their popular collections, typing a title or by ingredients), then you can sort by title, rating or relevance. I also love the fact that you can read reviews ~ with the most helpful ones generally at the top. Using my Pampered Chef medium scoop (that holds about 2 tablespoons of batter), we dropped our spoonfuls onto a cookie sheet & baked them for about 13 minutes. Now for the sea salt part that we added, thanks to Laura's vacation indulgence! Immediately after removing the cookies from the oven, Laura sprinkled them with sea salt (also from Trader Joe's ~ & it only cost her $1! ), & we waited for them to cool. They were so good that ate 3 of them before lunch! & totally worth turning the on the oven in the middle of the summer! Go check out some great things that other people are loving!! Yum - O! And I love both Pampered Chef and Trader Joes :) Now I really want a cookie! "I'm Going to Make a Cake"
"You'll Always Be My Best Friend"
"For the Price of a Cup of Tea"